From multiple sensors using multiple technologies, a best initial estimate of the total energy of the event is about 300 kilotons of TNT-equivalent, Brown said, though he stressed that the number could change as scientists learn more. In that 1908 event, a 130-foot-wide (40 m) object exploded over the Podkamennaya Tunguska River in Siberia, flattening about 825 square miles (2,137 square km) of forest. 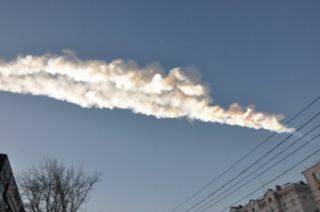 In a cosmic coincidence, the most recent Russian fireball exploded just hours before the 150-foot-wide (45 m) asteroid 2012 DA14 was set to cruise within 17,200 miles (27,000 km) of Earth today, marking the closest approach of such a large space rock that scientists had predicted ahead of time. The two events today are unrelated, NASA researchers say. The time of the main explosion of the recent meteor was 10:20 p.m. EST on Feb. 14 (03:20:26 GMT on Feb. 15). The object was traveling about 40,260 mph (64,800 kph) when it entered the atmosphere, researchers said. Based on the long duration of the event and videos taken by observers, Brown said it is clear this was a very shallow entry, certainly less than 20 degrees and maybe even more shallow. As for damage caused by the fireball detonation, the airblast clearly caused window breakage and light structural damage in downtown Chelaybinsk. “The exact overpressure at which window failure occurs tends to be probabilistic and varies by construction design," Brown said. "As the fireball had a shallow trajectory, the cylindrical blast wave would have propagated directly to the ground and would be expected to be intense. This could be further compounded by any fragmentation [or] quasi-spherical blasts." As for event comparisons, Brown said the Sikhote-Alin meteorite impact of Feb. 12, 1947 in the former Soviet Union was the equivalent of about 10 kilotons TNT. “But as an iron impactor, much of this energy was deposited at the ground rather than at altitude," Brown said. "The Oct. 8, 2009 Indonesia event is the most recent similar event, at about 50 kilotons, but [it occurred] over the ocean." Brown cautioned that data on the event is preliminary. “I fully expect revision of some of the numbers … particularly the estimate of the yield, which could easily change by a factor of two upon more complete analysis and will likely change as the day progresses,” Brown concluded. Leonard David has been reporting on the space industry for more than five decades. He is former director of research for the National Commission on Space and a past editor-in-chief of the National Space Society's Ad Astra and Space World magazines. He has written for SPACE.com since 1999.Follow SPACE.com on Twitter @Spacedotcom. We're also on Facebook & Google+.